I am a researcher. I love data. But every now and then, I have to call BS on some research. In this case, I must disagree with, or caution the bullishness of Forrester Research on their tablet adoption study. We have three tablets in our family, all iPads. We are also early adopters and gadget collectors. We have boxes full of eReaders, blackberrys, palm treos, and iPhones. We love this stuff. Now here is my view. iPads are great, but they are not "all that great." To everyone in our family, they are vitamins and not pain killers. For mass adoption, they will need to become pain killers. I would like Forrester to do the following study. When you are at your office desk, rank which device would you use the most? For me it would be Laptop, Smartphone, tablet. When you are in your car, rank which device would you use the most? For me it would be Smartphone, laptop, tablet (I have internet in my car, and if I am not driving, I would use my laptop). When you are reading in bed, rank which device would you use the most? For me it would be Tablet, Smartphone, Laptop. I read on my tablet, but do not browse the internet. I keep my phone by my bed at night in the charger. The Laptop rarely makes it to bed. By the pool or the beach, rank which device would you use the most? For me it would be, Smartphone, Tablet, Laptop. Again, if I am reading a book, I would bring the tablet. I would not take my laptop for fear of damage. I always have my phone. At a conference, rank which device would you use the most? For me it would be Smartphone, Tablet, Laptop. I always carry my phone, and hate to carry my laptop. If I am going to be at a conference all day, I usually bring my tablet. I can do more with it than an iPhone. Its a tweener - something that comes in between. Tweeners usually do not have mass adoption. Certainly not the mass adoption that Forrester is predicting. I do agree that tablet usage is on the rise, and that there will be tremendous adoption beyond what they have experienced so far. But I think that it will burn out beyond luxury unless something odd happens. The oddity would be for a class of citizens to adopt them, like students. I think that a tablet would be great for my 9 year old to have in school - especially if her desk was equipped with a bluetooth keyboard and touchpad or mouse. Anyway, this is my opinion. 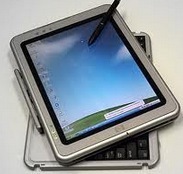 Here is the article about the Forrester Tablet Research on TechCrunch. Chalk another one up for the mobile revolution: There were 56 million tablets purchased worldwide in 2011, but a new report from Forrester Research predicts that number will explode in the years ahead: its researchers say that there will be 375 million tablets sold by 2016, representing a compound annual growth rate of 46 percent, and that by 2016 there will be 760 million tablets in use overall. Apple, which effectively created the tablet market with the launch of its iPad two years ago and has been setting the bar for what to make ever since, has seen some reduction in its tablet market share over the last year or two as more competitors have launched products. But Forrester predicts will manage to hold on to its lead going forward as the market’s “clear leader” in the words of Forrester researcher Frank Gillett. Part of Apple’s strategy to stay on top will be to target newer markets like the enterprise segment — which will represent one third of all tablet buyers by 2016 — and consumers in countries like China. Meanwhile, Android will actually see a net decline in its installed base of tablets by 2015, with Microsoft also gaining ground in the process. The other big challenge for Android, Forrester notes, is the proliferation of forked Android device makers. While we still have no news of Amazon launching a Kindle Fire product outside the U.S., Forrester is very bullish on how it, and others making forked Android tablets, will fare. Although tablets, by and large, are not as functional as the average PC, Forrester says that we will see a new class of consumer electronics emerge that will fill that gap: “frames” (effectively docks), which Forrester predicts will become a common way to give tablets more features, more power and link them up to other devices, like TVs, to use them to consume content. “Frames will become a new form of stationary PC, rising in volume even as laptop growth decays, redefining the desktop PC market as the stationary PC market,” Gillett writes.